St. Louis, Missouri — The World’s No. 3 ranked racquetball player added another professional tournament title to his trophy case last weekend. 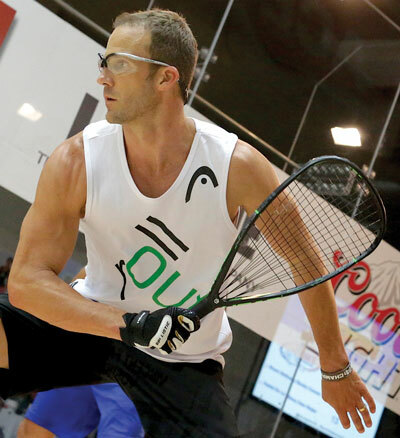 HEAD Penn’s Rocky Carson won the International Racquetball Tour’s (IRT) “Party with the Pros” event in Missouri on Saturday. Coming off a semifinal appearance at the largest event of the year at the UnitedHealthcare US OPEN Racquetball Championships just the weekend before, Rocky fought through upset attempts by the No. 7 and No. 3 ranked players on the IRT to reach his third final of the season. The tournament victory is Carson’s 19th professional tournament victory of his career. The St. Louis event was Rocky’s 198 appearance on the IRT, moving him into third all-time. His overall match winning percentage on tour is more than 70 percent. Last summer Rocky defeated the best players in the world on the indoor courts at the International Racquetball Federation’s (IRF) World Racquetball Championships in Canada. Carson’s gold medal was his ninth indoor World Championships medal of his career. To follow Rocky and the rest of the HEAD Penn professional players, visit: facebook.com/headpennracquetball.